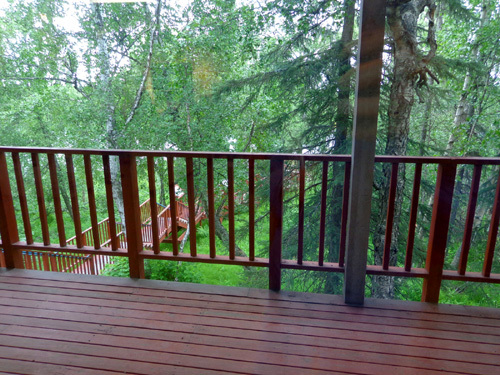 "Located just 140 miles from Anchorage, Soldotna is the central hub of the Kenai Peninsula. 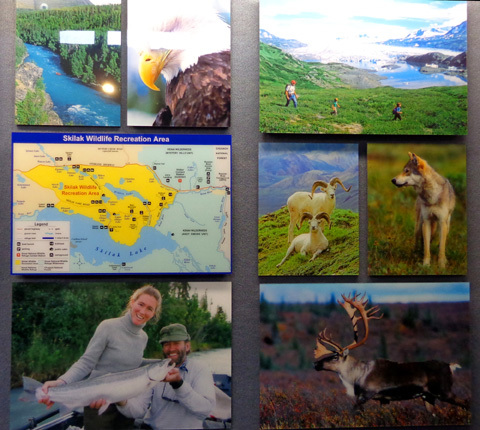 brown and black bears, wolves, ducks, geese, and many other types of wildlife. 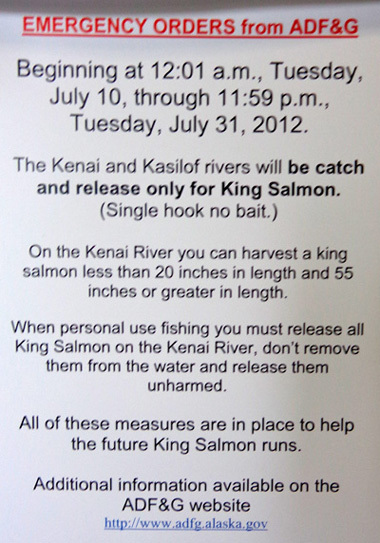 You can fish the world-famous Kenai River (home of the 97+ lb. world-record King salmon), go camping, hiking, birding, or rafting . . ."
Another good reason to build a town at this location is the Kenai River, which runs right through Soldotna near its outlet on Cook Inlet. That AAA map doesn't show the Kenai River very clearly. It generally parallels the Sterling Hwy. 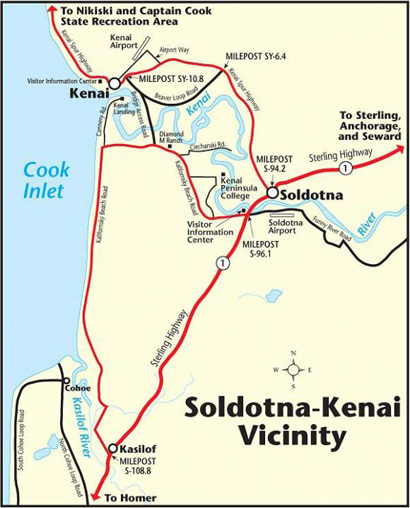 (AK 1) to the south, crosses the road in Soldotna, and flows into Cook Inlet in the town of Kenai. This small city of about 4,000 year-round residents is overrun with visitors right now, at the beginning of the dip net fishing season. The Kenai River is one of the premier salmon fishing rivers in Alaska, nay, the entire world. Can you say "fishing frenzy?" And that's why we're staying down the road a bit at the Kasilof RV Park, where it's much quieter. We both slept in our warm, cozy bed until 8 this morning. That's late for us. It�s hard to get up early when it�s wet, gray, and chilly. The highs were only in the mid-50s F. again � the highs! We need some sunshine again. It was cloudy and/or rainy all day. We drove up to Soldotna late this morning to visit some of the attractions we've read about. 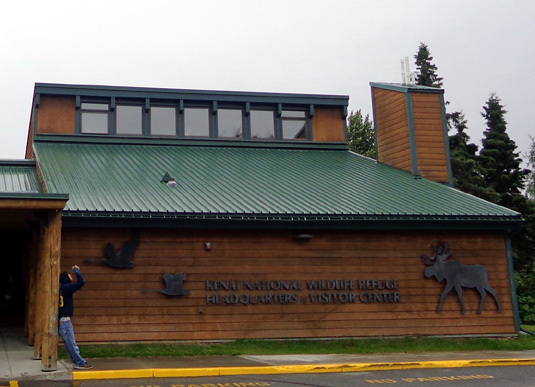 Our first stop was the Kenai National Wildlife Refuge visitor center, located just southeast of town at the top of Ski Hill Road. If you look at the first map above you see a lot of green. Those areas are various state and national public lands full of mountains and streams that people can enjoy. The wildlife refuge alone covers a whopping 1.92 million acres. Most of it was set aside in 1941 when FDR was president to protect the moose, bears, Dall sheep, mountain goats, and numerous other species of wildlife that call the Kenai Peninsula home. The remainder was added in the Alaska National Interest Lands Conservation Act of 1980. 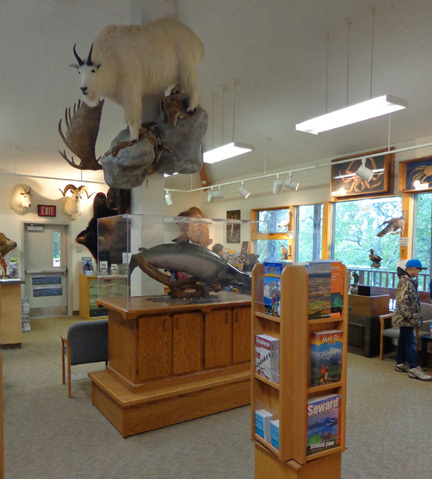 The visitor center hosts over 25,000 visitors every year. We recommend a visit there if you're in the area. 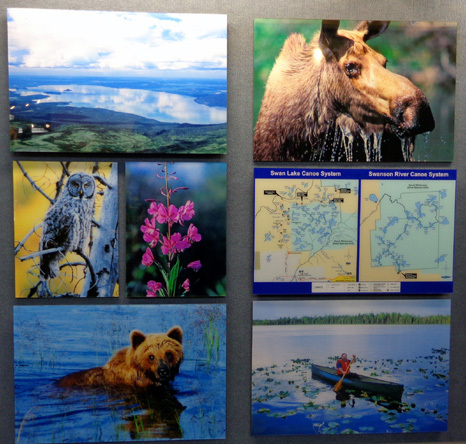 The museum has interesting free exhibits and you can gather lots of information about hiking, backpacking, cross-country skiing, and canoeing in the wildlife area. You don't have to be an athlete to enjoy the wilderness. 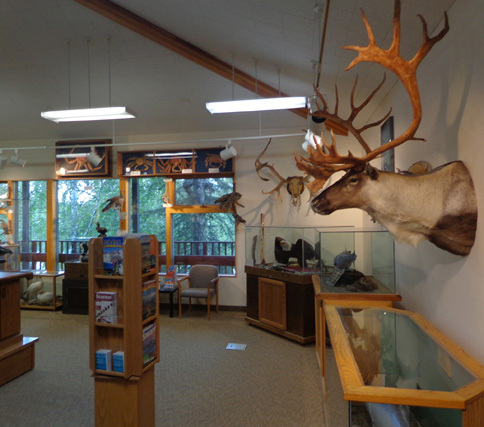 You can learn a lot from the exhibits and films at the visitor center, take a short walk on the nature trails near the visitor center, look through the books and gifts in the Alaska Geographic store, and watch wildlife films. This is one of the more interesting exhibits, called "Riddle of the Racks:"
Two healthy, mature bull moose challenged each other to a battle that ended in their deaths. Their antlers suddenly interlocked and they thrashed around unsuccessfully until they both died. By the time the skeletons were found bears and other critters had fed on the flesh. Sounds violent, but that's life in the wilderness. Or, as Jim would say, bears gotta eat, too! 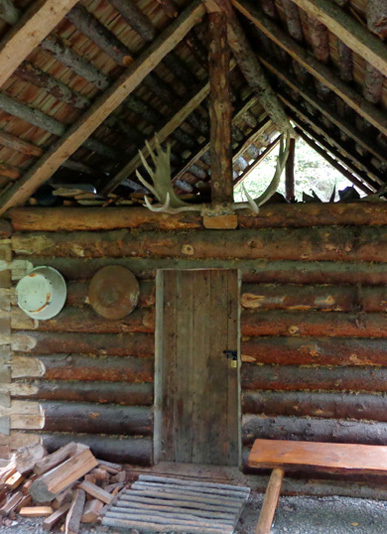 We browsed the exhibits and literature inside, then walked a short distance to an old cabin outside. 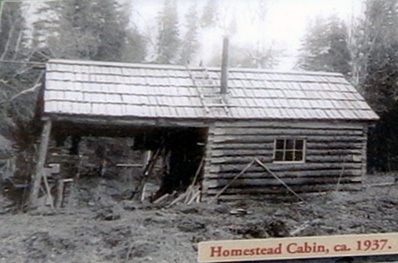 It was one of several cabins built in the late 1800s and early 1900s by Andrew Berg, who moved from Finland to Alaska in 1888. Berg lived in the area for about 50 years and became internationally recognized as the best big-game guide on the Kenai Peninsula. He kept extensive diaries that give modern visitors a detailed glimpse into his lifestyle. 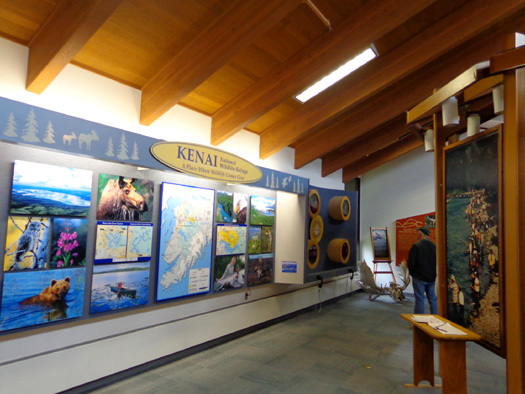 The visitor center also features some information about cultural history from the earliest human inhabitants who lived on the peninsula beginning about 8,000 B.C., to the Riverine Kachemak fishermen about 1,000 B.C., the Dena'ina Athabascans of 1,000 A.D. (who continue to live here), and the Russian fur traders who settled in the area in the late 1700s. Two hiking trails begin at the visitor center. One is � mile long, the other three miles long. Dogs and bikes aren�t allowed on them. It was raining today so we weren�t motivated to hike on either one. If the weather is better tomorrow we may come back so I can do some hiking. I don't know yet of any other nearby trails. By noon we were ready for some lunch. Before we left the campground this morning we asked Jan and Don, the owners, where we could get some good clam or salmon chowder. 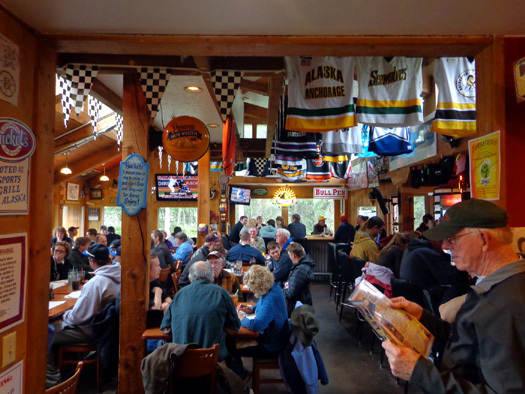 They recommended Rocky�s, on the Sterling Hwy. near the Kasilof River, or Buckets, across from the Ford dealer and Fred Meyer store in Soldotna. Since we were in town we headed to Buckets restaurant. It�s an attractive wooden structure with lots of TVs inside that are tuned to sports stations. Each table has a control box to listen to whichever TV the patrons want -- or not, as we chose. We aren't "into" either sports bar-type restaurants or eating out much. We waited for a seat for about 5 minutes, then waited about 40 minutes for our chowder and house special cheese bread (the place was packed). Both the soup and bread were good. We might go back for a salmon or halibut dinner while we�re here. Prices seem high but we haven�t had dinner out yet this whole trip. I told you we don't eat out much! After lunch we drove over to the Soldotna visitor center, conveniently located on the Sterling Hwy. next to a bridge over the Kenai River. The building also houses the Soldotna Chamber of Commerce. 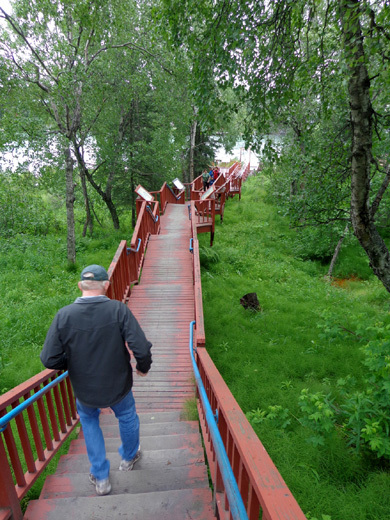 We browsed the exhibits there, picked up some tourist information, and walked down the long wooden steps to one of many public fish walks along the Kenai River. 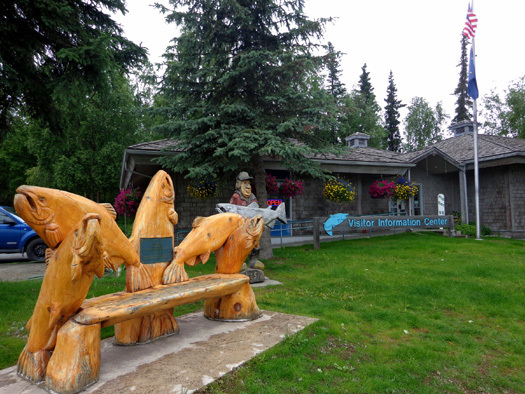 The visitor center showcases the world's largest sport-caught King salmon. 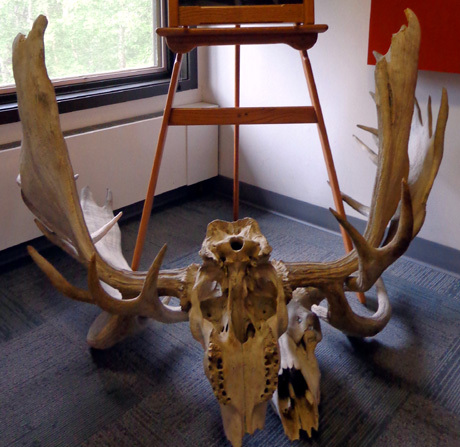 It weighed a hefty 97+ pounds and was caught by a local man in 1985. Soldotna is one of the fishing hot spots in Alaska and we naively managed to arrive at one of the busiest times! 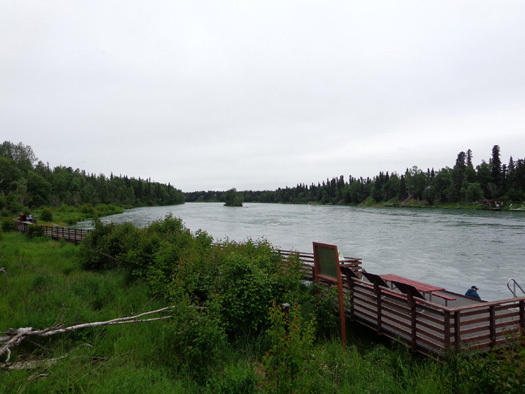 The Kenai River enters Cook Inlet a few miles NW of Soldotna and it�s a very popular place to fish. Although there are more limits than usual on the number and kind of fish that can be caught this year the place is still swarming with fishermen and women. That makes it more interesting to watch the activity along the river but it also makes campgrounds, restaurants, groceries, and other businesses and streets more crowded. 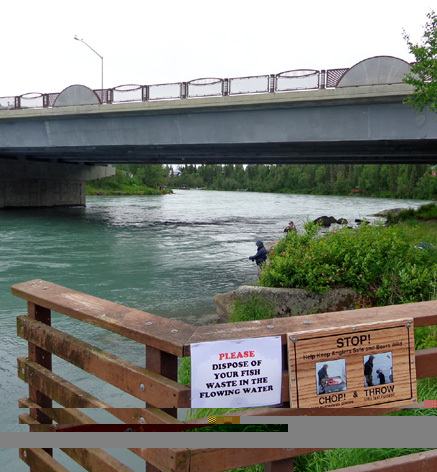 People fish for at least four of the five types of salmon found in Alaska in the Kenai River. Their various early and late seasons can last from mid-May to October. Mid-July is usually about the busiest it gets. It's a long walk down to the fishing decks from the visitor center but well worth your while if you're interested. There are other fish walks in town that are much more easily accessed (including this one, if you park down the hill). 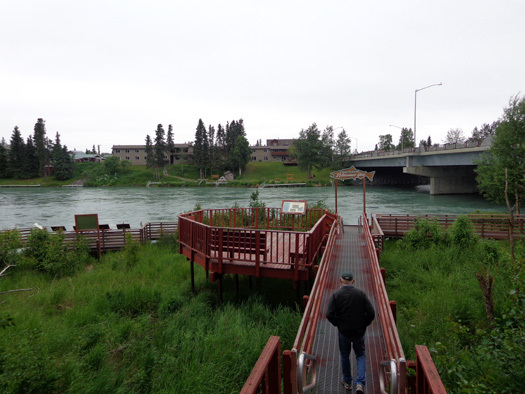 Because of the fragility of the river banks -- and the large amount of riverbank that is privately owned -- steps and decks have been built along the Kenai River in several places in Soldotna for free public fishing. No bank fishing is allowed along the other parts of the river. When we reached the decks and fish walk we read all the signs about the natural and cultural history and watched several folks fishing. I don't believe anyone was using dip nets here. 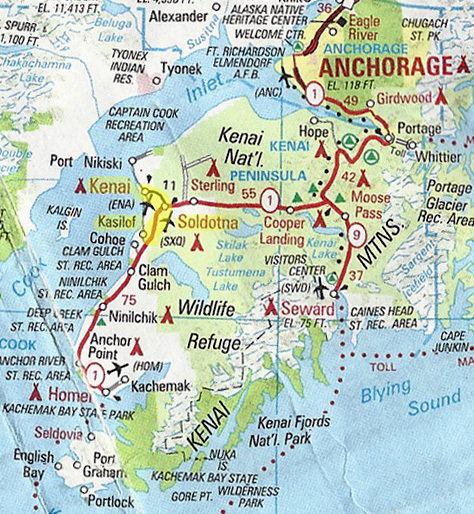 We'll see what that's about when we go to the nearby town of Kenai. 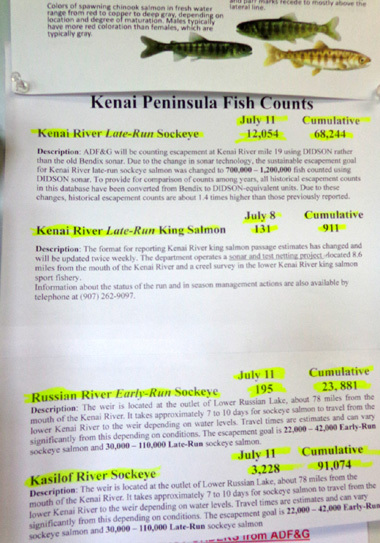 The Kenai River attracts sport fishermen from around the world. Although these visitors, commercial fishermen, and state residents from other parts of Alaska bring millions of dollars of business to the area, the influx also poses challenges for the agencies responsible for protecting the river and making sure residents who need the fish for survival (subsistence fishing) have an adequate supply. There are all kinds of competing interests, both human and environmental. 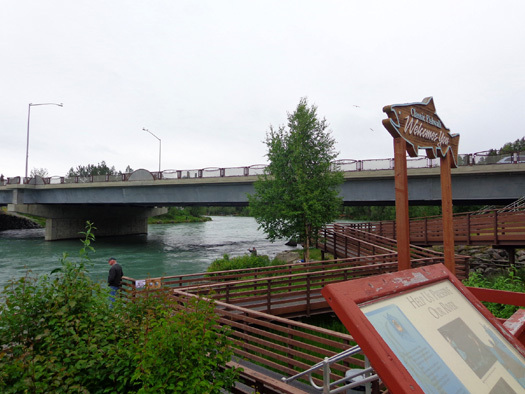 One of the interpretive signs describes the importance of the Kenai River through the millennia as a transportation "highway" for the early and more recent inhabitants. There is evidence that Eskimos used kayaks to travel upstream into the heart of the Kenai Peninsula to salmon spawning grounds as early as 1200 B.C. Dena'ina Athabascan Indians used the river even more intensively between 1000-1750 A.D., building villages near its lakes and confluences with other streams. At the turn of the 20th century prospectors, trappers, and hunters navigated the river for gold, trophies, and food. 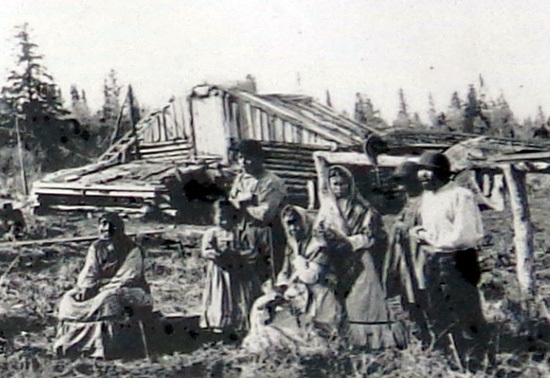 After WWII homesteaders settled in the Soldotna area and continued "mining" the river for its various riches. Appropriately, our next stop was the nearby Soldotna Homestead Museum. I'll talk about it in the next entry.